It would appear that several months will always go past before I manage to update this blog. This is partly due to the nature of my research, I’m not finding out new things that often, certainly not in the way that fieldwork archaeology projects might. I’m currently in the middle of writing my thesis; ‘What have you discovered?’ I hear you ask. I’m not going to reveal too much just yet but I think it is suffice to say that community archaeology in Dorset is really interesting. I’ve come across many fantastic examples and met some wonderful people. The focus of the current chapter is about setting the scene for community archaeology in the Dorset (and in Cambridgeshire my comparative area). It is really important to consider all the influences on the people that are practicing community archaeology, myself included. I’ve looked at the development of professional archaeology, current population statistics, the study of archaeology in universities and much more. Of course one of the most important recent developments that I’m going to have to add is Brexit and all the potential ways that this might affect community archaeology. In another chapter I have been thinking about local archaeology societies, what are they exactly? There are so many groups that might not define as archaeology societies but that have archaeological interests and even conduct fieldwork. There are also many groups where the term local doesn’t necessarily apply. Some groups seem to be interested in sites with a 50 mile + area. Within others the members live all across the county and travel distances to come together on one site. This entry was posted in Uncategorized on October 20, 2016 by Hayley. It has been a while since I updated this website, sorry about that, I got carried away with my research. So what have I been up to? Interviews. Interviewing and transcribing interviews! Yes, it has taken months but I’ve learnt a lot and gathered lots of information rich data that now just needs mining, analysing and turning into a thesis. The interviews have been the major part of my data collection. I realised that I could not determine the impact of community archaeology by myself or just through setting up some case studies. 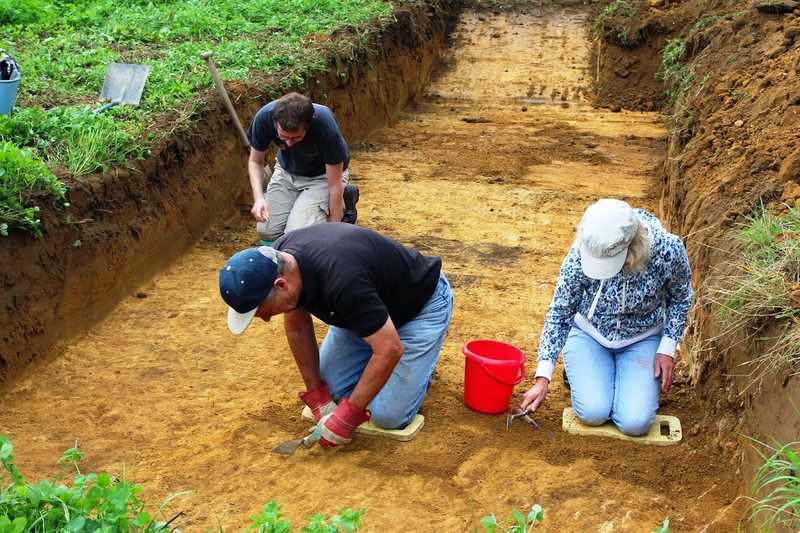 By interviewing a whole range of archaeologists across both Dorset and Cambridgeshire I have been able to gain a much better understanding of what people think community archaeology is, what it does, how it does it and what archaeologists think of this. I placed particular emphasis on local archaeology socities within the interviews, in order to understand this phenomeon better, but those interviewed including volunteers, members of local archaeology societies, and archaeologists who are employed in a range of jobs. It does not yet include the public- I’m working on that one. The next step is to start to look for themes within the interviews. I’ll try and report back as I begin to make headway. This entry was posted in Uncategorized on January 27, 2016 by Hayley. It has been a little while since I last posted, my research is coming along nicely but what I’m really excited about is the response that I have received to the talks that I have given in Portesham. These were public talks about the Prehistory of Portesham and were designed to rope local people into helping me carrying out my research. Several options for fieldwork were presented and one has come out a clear favourite. Hopefully we are going to finish off Bournemouth University’s geophysical survey on the land around where the Portesham Mirror was found. I am pleased to announce that the landowners have given their consent in principle but now I need to coordinate with the BU staff and jump the paperwork hurdles. I’ll be in touch soon to announce training. 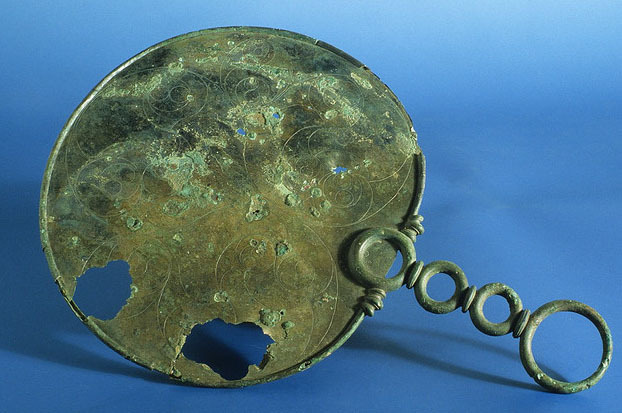 For more on the Portesham Mirror visit the Dorset County Museum. This entry was posted in Uncategorized on February 9, 2015 by Hayley. In case you haven’t heard I’m giving a talk in Portesham in January. For more info and to book tickets visit here. Whilst researching for this event I came across a tale that I thought was worth sharing even though it is not about prehistoric Portesham (I’m not giving away my secrets yet). it is instead about Roman artefacts found in an 18th century context. It has been taken from a book published in 1863. The original author, John Hutchins, carried out much of the research prior to his death in 1773. The episode is recorded as happening in 1765. Some workmen were digging chalk in Corton when they came across several skeletons ‘which lay regularly, side by side, in a direction from north-east to south west’. They were buried with ‘a row of small earthen vessels’, which sound to me as if they were Romano-British. 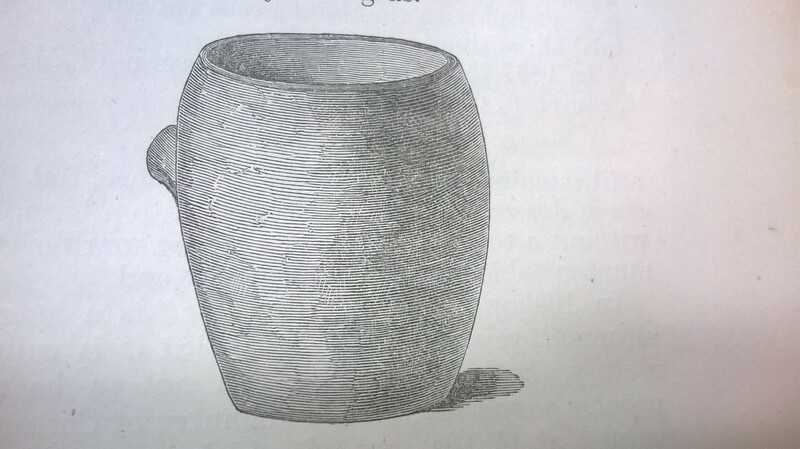 The author states that two of these were red with ‘some sort of characters’ and therefore it was particularly ‘regrettable’ that they were destroyed, one by a workman whilst digging (understandable) whilst the other ‘fell unluckily into the hands of a man who, being without a taste for things of this sort, wantonly made a drinking-cup of it, in consequence of which it is presumed to have been demolished’ (less understandable). Without a taste indeed. The author makes no mention of what happened to the other vessels although one is drawn in the book and shown below. All quotes and the image taken from The History and Antiquities of the County of Dorset by John Hutchins 1861. Edited by Shipp, W. and Hodson, J. W. . 3rd Edition. Published by E.P. Publishing Ltd in Durham in 1861. This entry was posted in Uncategorized on October 27, 2014 by Hayley. I have always known that community archaeology is a hard topic to define. I thought that I could acknowledge this, create my own definition and move on, but does this make my research relevant and comparable? I gave a presentation to the Dorset Archaeological Committee (DAC) who questioned this. One chap asked if I meant ‘amateur archaeology’. Another response was ‘but I do it by myself’ and a lady apologised that their project would not be doing community archaeology during their next season, because they would not be having open days, school visits or new volunteers. Later in the month I then attended a conference session on Defining Community Archaeology in a Global World- see my review here. In different places community involvement with archaeology is appropriate in different ways. In Ireland, for example, it is illegal to carry out archaeological fieldwork without a license. Examples were also given of projects in Romania where school kids were involved in the creation of a travelling archaeology exhibition and in Moldova various communities were involved through providing practical assistance e.g. the local fire brigade provided ladders. In the UK the term ‘Community’ has become a popular, but also political, term. It is sometimes misappropriated and is often now applied to many projects and ideas, archaeology or not, in order to gain popular support. It is a buzz word, and buzz words often mean funding. Community Archaeology is no exception and, although this is why I have a funded PhD, I should not fall into the same trap. I’m going to have to create a definition of community archaeology that is appropriate to Dorset. It is important that I work out my definition from the phenomenon and not make assumptions about an ill-defined buzzword. These events have broadened my perspective but now I need to narrow my definition, hmm. I think I need to continue to find more out about what is happening in Dorset. Last week I led my first guided walk on the South Dorset Ridgeway. This walk was a slightly unusual one, in that I asked people to contribute their suggestions for locations and then based the walk around these. This meant that the location was a surprise until a few days before. There were a few repeated themes within the requests- the Neolithic was one, Long Bredy a second and Round barrows (or Tumuli) another. I decided that we would go to Maiden Castle because this would allow us to consider the Neolithic and Bronze Age landscape. It will also complement a future visit to Long Bredy. I promised the participants that I would not discuss the Iron Age and although I had to make a few quick references to it I think they were satisfied. 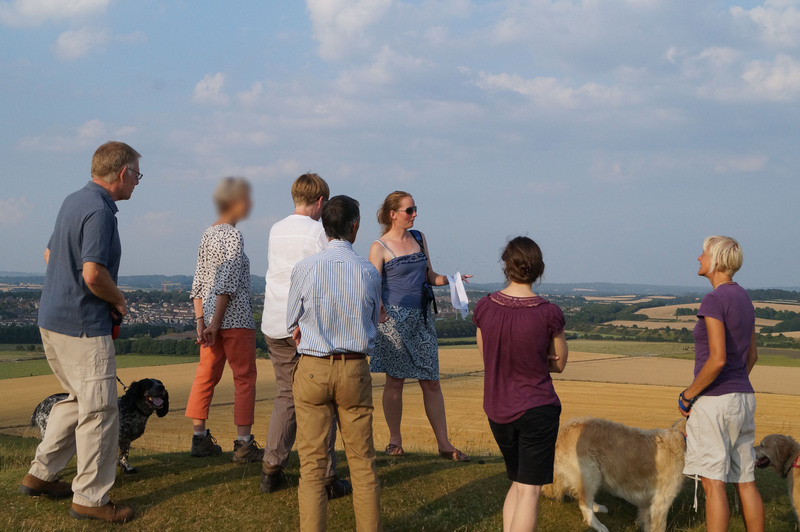 I hope that this slightly different perspective gave them a greater understanding of the South Dorset Ridgeway. but I will also post it in segments over the next few weeks. The feedback that I received on the walk was positive. This pick you own guided tour was more successful than I imagined. The participants seemed to like the idea of an element of surprise and were not put off by the subject not being directly what they had suggested. The only negative comment from somebody who elected not to come was that that Maiden Castle was a boring place to go for a guided walk. I hope that I proved otherwise to those that took that gamble and joined me. Thank you. I hope to carry out future walks although nothing is planned at the moment. Keep your eyes peeled for my advertising. This entry was posted in Uncategorized on July 31, 2014 by Hayley. The walk today will be visiting Maiden Castle but I promise not to mention the Iron Age! We will be looking at the earlier landscape and the view from Maiden Castle Bank Barrow. This entry was posted in Uncategorized on July 24, 2014 by Hayley.